We met Charlie in Palma – blond hair, blue eyes and confident. He worked on another Oyster 575 called “Calliope” for Charles and Nicky Manby and because he shared the same name as the owner he was nick-named Charlie. He joined Miss Tiggy to assist James with skippering the boat – at 26 he had spent the majority of his life in boats of various sizes and shapes and has a great feel for sailing. He has been a real asset to have working alongside us – part of our “band of brothers”. Charlie throws himself into everything and gives 120%. He has even become a passionate supporter of the Melbourne Demons without ever watching a game. He would scan the Internet every morning, where possible, and update James about injuries, best players and sing “It’s a Grand Old Flag” in full voice. If there was ever need for encouragement about anything he would cry out “Go Dee’s”. Energetic, cocky, fun, impatient, sensitive, musical – Charlie is a walking dichotomy between full steam ahead and sprawled on the couch watching a movie with great intensity. He loves to kite surf and listen to slow, melodic music. He is first to offer assistance if help is needed and will jump in the tender and take off at full throttle whenever the opportunity presents itself. No one was more taken aback when we were telephoned to say that Charlie was heading to hospital unable to breathe properly…then an hour later he was moved to Intensive Care. Thanks to Dobra, an Emergency Physician who happened to be sailing on the rally with us, and her insistence that the hospital perform a CT scan, Charlie will be OK. His scan uncovered a large blood clot in the upper part of his right thigh/groin area and another in his right lung with evidence that it had traversed through the right side of his heart. The question, once he has recovered, will be – how did this happen to a healthy and fit young man? 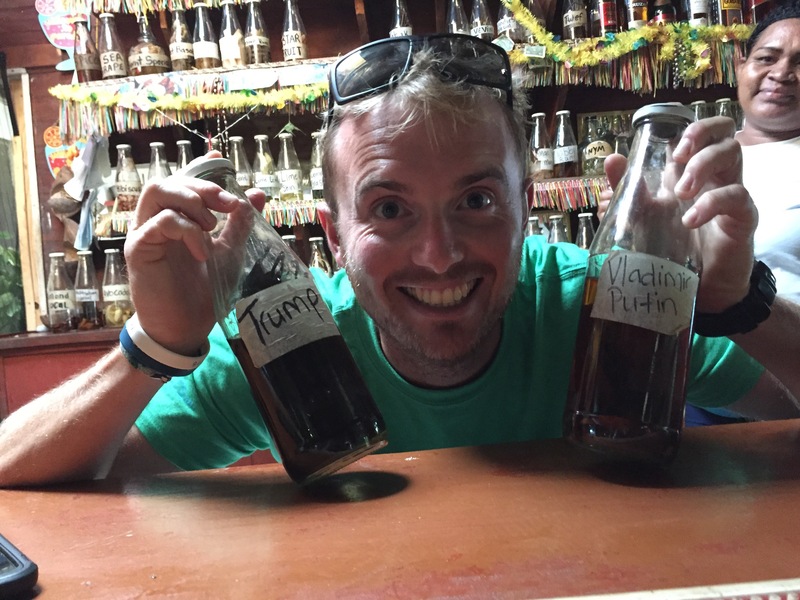 For us it is a sad farewell to our new mate who wanted to traverse the Panama Canal and sail out into the Pacific Ocean with us – destination Australia. We wish him a speedy recovery and hope to see that face back on our boat some day! Our 2 day transit through the Panana Canal is now complete and an absolute highlight so far! There was much discussion pre transit as to how it would all work. The plan was to raft up 3 similar sized Oysters – the port and starbord yachts to control the lines and the central one to keep the nest on track. Meetings were had and tactics and additional crew put in place (you must have 4 crew plus the Skipper) and we were ready to go. 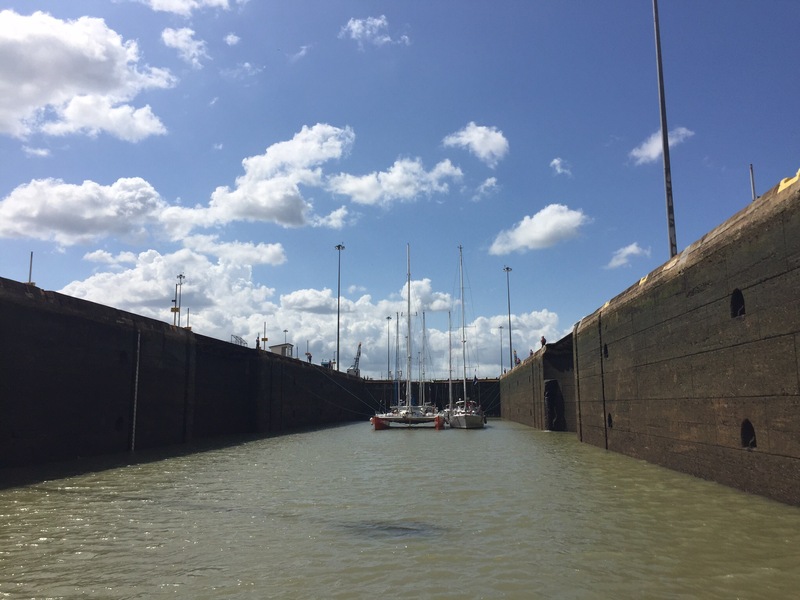 Our Transit Advisor, Oswald, came on to Miss Tiggy at 3.30 on Day 1 and once we were rafted up with Oyster 575s “Sophistikate” and “Tianelle” we completed the first 3 locks placing us approximately 25 metres above sea level and into Lake Gatun. At night in the Lake our flotilla of Oysters and an additional catamaran were once again rafted up (it is a very tightly controlled operation). Oswald was collected by a Pilot launch only to return at 7.00am the next morning to assist us in the completion of our transit – a 4 hour passage across the lake to the Guillard Cut and the final 3 locks. As the gates opened for the last time a huge cry went up – we had arrived in the Pacific!! Thanks to our hard working crew/rope handlers (Mike, Robert Van, Popeye) who saw us safely through the 30 miles of locks and lake! Preparation for entering and cruising in the Galapagos has been intense. Understandably they have very strict rules and regulations to protect the wildlife and pristine waters of their island group so intensive cleaning of Miss Tiggy both inside and out as well as a haul out for a pressure hose off and 2 new coats of anti-fouling has been completed. A diver will complete a final check and a certificate will be issued as proof. Food is another thing and provisioning is difficult and restricted. No seeds or nuts, fruits and vegetables, limited cheese and dairy products, meat that has been vacuum sealed with a use by date from an authorised vendor (we are hoping that a supermarket chain will suffice for this) and so on – and to add to this complication, our freezer has decided to stop freezing! Ah! Hi Tig & James, Caught up with the VGs in Hobart on the weekend and heard about the adventures of Miss Tiggy. Thoroughly enjoying reading your blog and look forward to the next instalment. So many amazing places and unforgettable experiences! Life in Brizvegas is so incredibly dull in comparison!